Ok. I am gearing up for my final baking day of the holidays with the kids tomorrow. My God-children are coming over and with the girls we are all going to go into a baking frenzy. All the cookies. All day. Send coffee. So, in my baking frenzy, I have to bake more of these angel thumbprints. Per usual, of everything I have baked this season, these have been the favorites so far- even with the kids! I just made my 4th batch in 3 weeks. We eat them from the freezer after dinner almost every night and I have caught the kids sneaking them out the door in the morning like they were somehow breakfast-like with the jam on them?! There is an original recipe here that was my grandmothers, but I have happily made a vegan, allergen-free version here. There is the option to add toasted walnuts (or pistachios or almonds would be delicious! ), but if you have a nut allergy, obviously refrain and they are still wonderful. 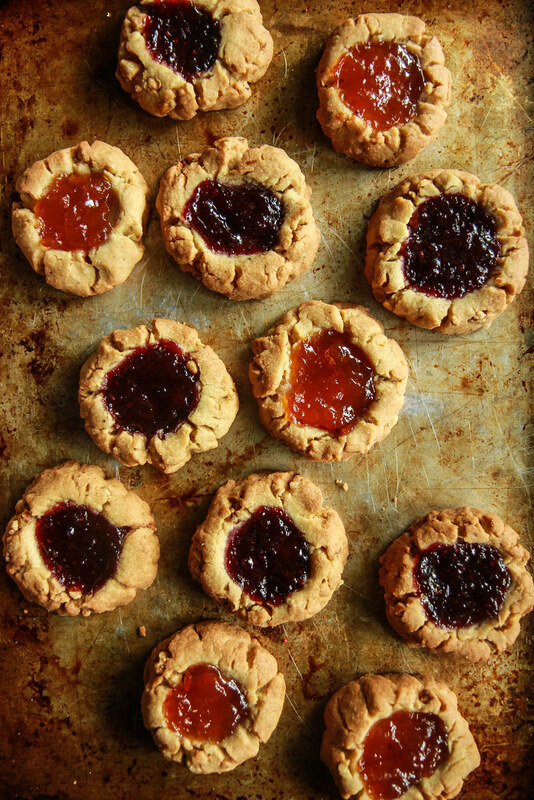 I used a combination of plum-blackberry jam and apricot jam on these cookies, and then another time I did all raspberry or blackberry- Anything is delicious, you just want to make sure it is not too runny so it stays put in the cookie. And by the way- you can either use coconut oil or vegan butter in this. The jury was split down the middle for the most part. Half of my family liked the vegan butter because it made the cookies so crispy and “buttery.” The rest of us (including me) liked the coconut oil better. Whichever you usually like to bake with or have in the house is what you should use! In the bowl of a standing mixer, whip together the coconut oil, brown sugar and vanilla until smooth. In a small bowl combine the dry ingredients and then add them to the mixer. Whip together until smooth and then if using, add the nuts and combine until well incorporated. I gently flatten the round with the palm of my hand so you have more of a disc than a ball, then gently press your thumb into the center of the cookie to make an indentation. 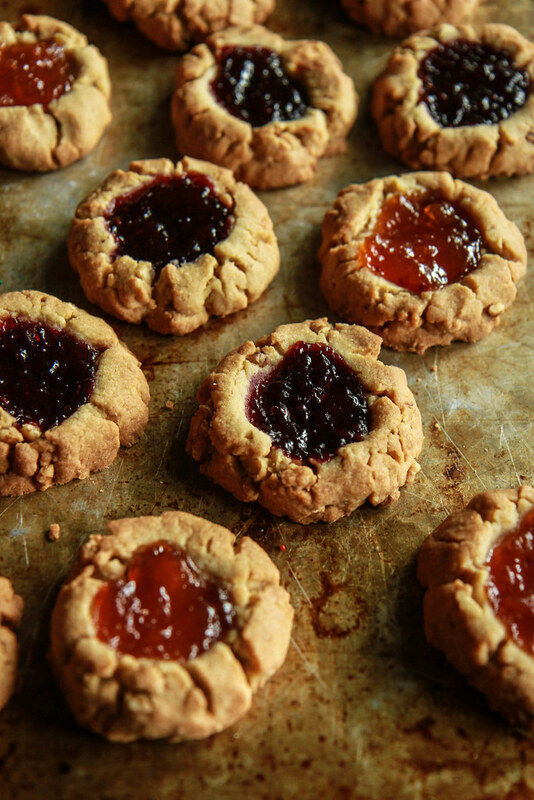 Because I like a lot of jam, I do two thumb indentations, side to side so that more jam can be in the cookie. Using a small spoon, fill the indentations with jam or jelly. Bake for 17-19 minutes at 325 degrees or until golden around the edges. Let the cookies cool before serving. Store in an airtight container at room temperature or in the freezer. Makes 16 large thumbprint cookies. You say these are Gluten Free but you have 2 cups of flour in the recipe?? Perfect I look forward to making these for my son during my cookie bake with friends. Happy Holidays! These would be great for a cookie exchange! I’ve always LOVED thumbprint cookies..now everyone can enjoy them! Sorry about the head stuff 🙁 Take care of yourself girl! 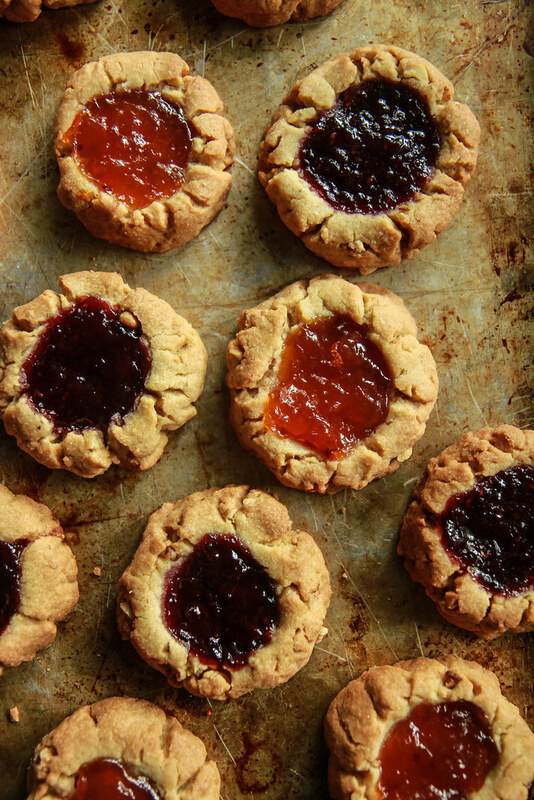 Love thumbprint cookies! So colorful and perfect for cookie exchange season! Thank you Savita! everyone will love them! I want some of these on my holiday cookie plate! Oh my gosh! That’s really scary, Heather! I hope your symptoms subside very soon! In other news – these cookies – I need them ALL! These are the cutest Heather! Love these for Christmas! Thank you so much for sharing this excellent recipe. I love the crisp, sandy texture this cookie has. Usually GF and vegan recipes are hit or miss for me, but this was standalone and even competitive with their gluten-filled counterparts. I’m making these for some friends that can’t have gluten or dairy. I used refine coconut oil and Bob’s Red Mill GF flour. I wouldn’t change a single thing about this recipe. Thank you so much Jackie!! So happy to hear that you liked them- they were favorites of ours as well! Hi there! I’m just checking out your site for the first time. I love your food and the photography. I was wondering if you’ve ever tried these thumbprints with lemon curd as the filling? I just made lemon curd for the first time about a week ago and I’m obsessed and want to use it in everything, but I’ve only used it on pancakes so far. Thoughts? Adding these to my “must-try” Christmas cookie list!